SPRING IS FINALLY HERE! Can you believe it? Is there anything better than waking up, walking out your front door and having the sun shining, birds chirping, flowers blooming, and seeing grass that's actually, you know, GREEN? 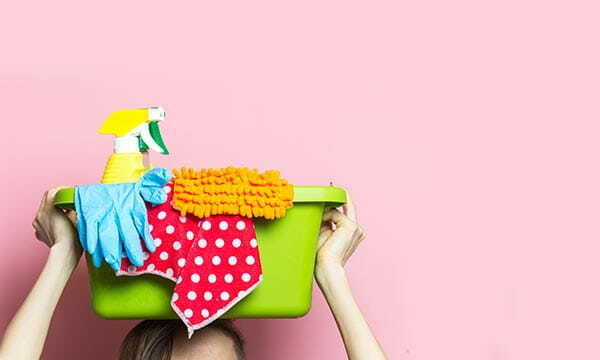 Imagine if once you returned home, your home was clean from top to bottom - ahhhh. I'll admit it. I never actually look FORWARD to spring cleaning. It's time consuming, hard work, and definitely takes some effort. But, I LOVE when it is done. Purging/donating things I no longer use/want/need is definitely a guilty pleasure of mine. And decluttering is good for the soul. Another guilty pleasure of mine is seeing a checklist fully checked off. So, to help myself digest all of my spring cleaning tasks, I created this checklist and thought I'd share it with all of you. It helps keep me organized, and going task-by-task helps keep me sane. Use it and think it was helpful? Have other ideas to make this checklist better? Let us know below! We also have a checklist for spring cleaning the OUTSIDE of your home here - check it out.